Fourteen-year-old Anton Lorenzon’surge to quench his thirst landed him in Sydney last week for a private concert by rock star Jimmy Barnes. 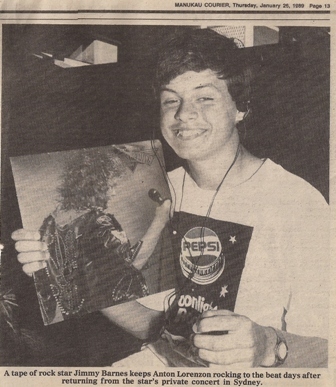 The Totara Heights choolboy was one of 24 New Zealanders who wen among 300 competition winners flown from around Australia and New Zealand for a private rock concert at Sydney’s Overseas Shipping Terminal, Circular Quay. The gig was part of a’Summer under cap’promotion by Pepst-Cola, Participants had to collect bottle caps with the words moon,light and rock to enter. Despite a record number of entries to the Moonlight Rock competition Anton scored the jackpot with his collection of caps. Although it was Anton’s second visit to the city it was the first time he had won a competition or seen Jimmy Barnes live in concert. “It was good fun. He’s a pretty good singer.” Before the concert Anton and the other competition winners, one only six years old, were taken from their hotel on Sunday to board a ferry for a twilight cruise of the harbour. After the cruise, the guests entered the Overseas Shipping Terminal via a tunnel of lasers that provided a spectacular-lighting entree to the concert. As well as enjoying one of Australia’s biggest acts this summer, Anton says the free food and drink was a highlight. South Aucklanders will have the opportunity to see the famous rocker during his forthcoming Barnestorming tour of New Zealand (sponsored by Pepsi) which features Iggy Pop, Knightshade and Choir Boys performing at Athletic Park, Wellington on February 3. As well as heaving this year’s b,st-selling instrumental album, guitarist Joe Satriani is a member of Mick Jagger’ band. 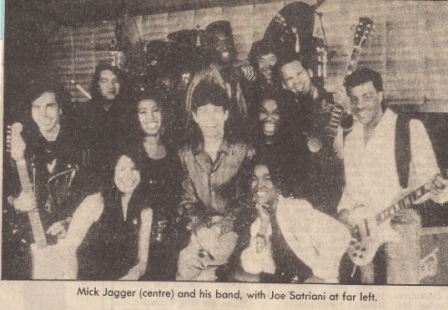 EVE FLAIN spoke to Satriani by telephone in Melbourne about Jagger, the concert in Auckland this. Saturday and his solo career. “You’ve always gotta be careful when you’re around Mick. You never know what he’s going to do, he may wanna jump on top of you,bite you – you never know. IT’S A CASE of South Auckland cabaret singer meets streetwise Polynesian reggae band. In a slightly unlikely marriage of musical styles, Herbs and Willie Hona have joined forces. The 29-year-old Hona, who reckons he’s played probably every pub in the country – plus a heap of clubs – in his 13 years in the business, shapes as a new front man for the re-formed Herbs. alive. The Hona addition is only one of the major changes to the group’s lineup, after two unsettling months when the band teetered on the edge of a permanent split. They all share the vocals. Gone it seems are Spenz Fusimalohi, Dilworth Karaka and Mori Watene. 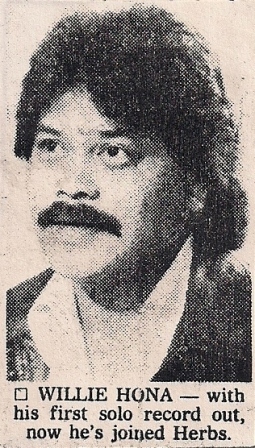 For Willie Hona the timing of the Hona/Herbs linkup seems poor: after all this time in the business, he’s he’s only just had his first single-a self – penned ballad, She Needs You released by WEA. But then, the man from Rawene, Northland, has switched from groups to solo performer throughout his career. He began with Mark Williams’band Face,in Dargaville, witched to , playing guitar behind Auckland cabaret, acts, became a solo artist with his.. own floor shoW … then, four years back, formed his own group the Hona Band. For two years he’s been back as a solo performer doing, as he says, “everything, mate. I do the works actually.” Hona believes he has to offer Herbs all ability to together a better on stage presence, his vocal and instrumental abilities – plus his song-writing talents. Although Hona has been doing only three originals in his act and hasn’t recorded anything until now he’s been writing songs for years. Already he’s written three reggae-style numbers for Herbs. He’s hoping the Herbs association will get him to Europe and to the break through with a record, much faster than he could as Willie Hona, solo night club performer. Besides, the band has agreed to do his new single and another as part of the Herbs act – and to let him do solo work that doesn’t clash with its gigs. As the man said: “It was the best of times, it was the worst of times,” but any year that sees Run DMC, Miles Davis and Townes Van Zandt, Mick Jagger at the Gluepot and Pink FIoyd at the Springs has got to have something going for it. Davis was widely considered one of the best of times, the Neon Non Picnic scheduled for last summer one of the worst. It was the year of the bimbette (Tiffany, Kylie Minogue. Debbie Gibson), of When The Cat’s Away (live, on the tele and in the Music Awards – everywhere in fact) and ageing rockers like Pink Floyd and Bryan Ferry still pulling crowds. 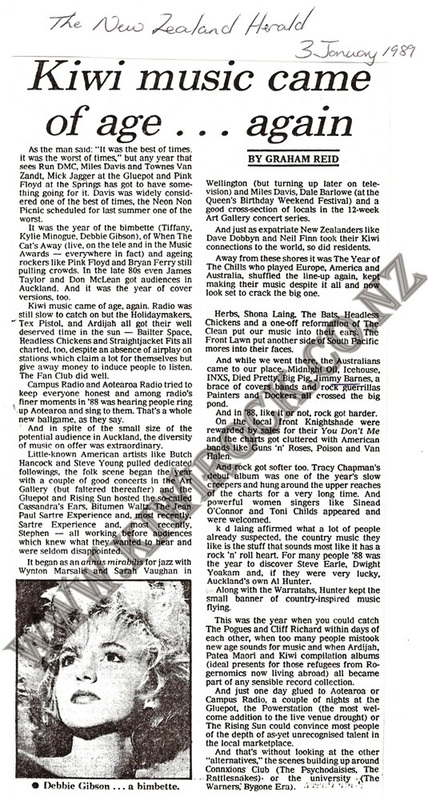 In the late 80s even James Taylor and Don McLean got audiences in Auckland. And it was the year of cover versions, too. Kiwi music came of age, again. Radio was still slow to catch on but the Holidaymakers, Tex Pistol, and Ardijah all got their well deserved time in the sun – Bailter Space, Headless Chickens and Straightjacket Fits all charted, too. despite an absence of airplay on stations which claim a lot for themselves but give away money to induce people to listen. The Fan Club did well. Campus Radio and Aotearoa Radio tried to keep everyone honest and among radio’s finer moments in ’88 was hearing people ring up Aotearoa and sing to them. That’s a whole new ballgame. as they say. And in spite of the small size of the potential audience in Auckland, the diversity of music on offer was extraordinary. Elvis Costello solo is, an intriguing prospect for the legion of fans who know him only from his big-selling albums with the Attractions and, later, country and orchestral ensembles. The angry young Englishman (depicted below) of the late ’70s and early ’80s has, however, been getting rave reviews during his international concert tour with Texan solo act T-Bone Burnett. Both artists perform one New Zealand concert – at His Majesty’s Theatre,Auckland – on June 27 so New Zealanders can judge for them selves whether the new style is an improvement. From a promising but inconsistent first album, Costello went on to produce the impressive “This Year’s Model” with the Attractions, his three piece backing band. The classic “Armed Forces” album which Costello claimed was strongly influenced by Abba, established him as an artist with both credibility and mass appeal – even if some critics condemned his bitchy lyrics. His promising career received a blow on a subsequent American tour when, in a drunken argument with Bonnie Bramlett and members of the Stephen Stills band, he made an unfortunate remark about Ray Charles. The echoes of that conversation in a Columbus, Ohio, bar echoed around the world and Costello faced accusations of racism from the media. The subsequent scandal caused Costello to retir and reconsider his position. As a musical campaigner against facism he was a little offended by the publicity, Since then his career has been erratic he has produced records for a variety of acts and made experimental albums like “Almost Blue,” “Imperial Bedroom” and the landmark “Get Happy” a set of ’60s-style soul offerings.He describes his latest work as “subversive.” New Zealand is about to find out what that means.